Last night, I heard an album that I’ve been listening to for years, for the very first time. Sure, I thought that I had heard it, but there it was, in all its finery, with all its glorious detail, revealed for the first time. Hidden in the lacquer were layers of harmonics, detail, and soundstage that I never knew were always there. You may ask, how did I extract this previously shrouded information? Easy, I upgraded my Oracle Delphi MKIII turntable to an MK VI–well just about an MK VI. The base, record clamp, and platter are still original. The suspension system was re-calibrated: The retrofitted new motor, the Torlon Thrust pad, the Micro Vibration Stabilizer system, and the drive belt are all brand spanking September, 2013. 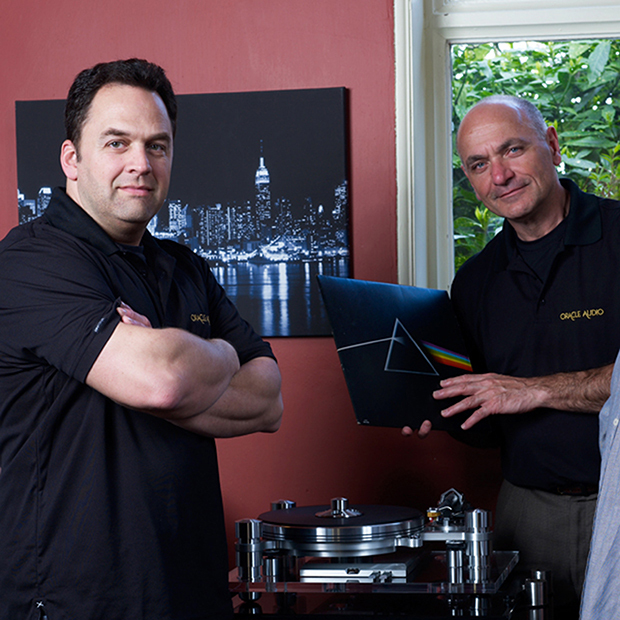 It could be argued that Oracle’s founder, Marcel Riendeau, changed the way we listen to vinyl. In the ‘60s, turntables evolved to the likes of Thorens’ and Dual’s simplistic designs of belt-driven platters, springing on a sub-chassis, housed in a wooden box. In the 70s, the Linn Sondek, a similar, no-frills-on-the-outside layout offered refinements underneath that allowed Linn a stranglehold on the qualities of LP reproduction for many years. By the late 70s Marcel, quietly lecturing philosophy at the University of Sherbrooke in Quebec, was also a fervent audiophile and musician. To supplement his “habit,” he dabbled in audio retailing and distribution and was searching for a high-end turntable. Nothing out there was good enough–neither sonically, nor aesthetically. So, necessity being the mother of invention, he embarked on developing a design of his own. Little did he know, Oracle was about to blow the lid off the (L)industry. Marcel agreed that the belt drive with a floating sub-chassis was clearly an improvement in the turntable’s evolution. This technique lowered the center of gravity while perfectly isolating the external energy from the platter. And let’s not forget the record clamp. This, now ubiquitous, breakthrough diffused the vibration, and resonance within the vinyl, by coupling it to Oracle’s eight pound platter. Oracle’s original introduction at the Consumer Electronics Show (CES) was an astounding success. Marcel returned with over 600 orders. Enter Jacques, his mechanically educated young brother, to engineer, and streamline, the production process. Marcel is always open to augmentation and suggestions. For example, he adopted an idea of the late, great Brooks Berdan, the well-respected Oracle setup mechanic at GNP in Pasadena and later, at his own store, which is still operating in Monrovia, near Los Angeles. Brooks had fitted many early Oracles with his own U-shaped weight around the main bearing to simplify, accurately attaching different tone arms. Coincidentally, that’s where I succumbed to my Delphi MKIII. I loved its space-age design and, more importantly, how its sonic transparency blew away all the other turntable set-ups that I had previously owned. As an industry innovator, Oracle is still evolving and implementing improvements whether platter, motor, the new, unparalleled Micro Vibration Stabilizer system or, “Even our record clamp” adds Jacques. Recently, at the well-respected Optimal Enchantment in Santa Monica, West Coast Oracle dealer Randy Cooley exposed me to the current, remarkable MK VI. He saw me sit stationary, entranced, staring into the void. I couldn’t help compare the resolution to my older Oracle. Music enveloped me. Notes seem to penetrate to the bone. I experienced an undeniable advance in audio resolution and reproduction. Then, he closed me. “The beauty of owning any older Oracle Delphi is that it is upgradable to within, as much as, 95% of the sonic values of the MK VI for only 45% of the cost of the MK VI.” How could I resist? So, off my Delphi went to Oracle and Jacques’ tender care. My lowly budget only allowed an upgrade of about 80% of the MK VI improvements at, around, 32% of the outlay of the MK VI. About 10 days later, SoCal’s Oracle set-up maestro Jay Nakamura set about reassembling this puppy in my home. The analogy here is: Can I tune a 12 cylinder Jag? Not a chance; I call doctor Jay — he even makes house calls. “And, once the Oracle is calibrated it’s stable for years,” he soothed. Today, upgrade in place, I sit listening with the exact same cartridge, tone arm, and stereo components, to the same trusted test records: I’m in awe of the additional warmth and depth of Yarlung’s award winning Antonio Lysy at the Broad; Stewart Copeland’s intensely detailed Rumblefish soundtrack; Chet Baker’s commanding No Problem on Steeplechase and, the stunning Dead Can Dance OMR release of Into the Labyrinth. And, there’s a new-to-me artist in town: Anne Bisson. Her Blue Mind album, masterfully recorded “LIVE” in 2008, has been adopted, not only by Oracle as a reference recording but, by many Hi-Fi outfits to demonstrate that vinyl still rules. Anne’s combined kicked-back ambience, surrendered with the tenderness of Diana Krall and nuance of Joni, have me mesmerized. Track 2’s opening kick drum, with such presence, confirmed that the upgrade had transported my turntable, and me, unto a new realm of vinyl reproduction. Call us crazy but, the satisfaction attained from the simple, uncolored sonic accuracy of that dampened kick drum resonating in the room as if the drummer is performing just for you, is the lubrication that keeps us loopy audio geeks constantly striving to improve our systems. It’s also nearer the rendition the artists and engineers intended us to hear. When you think about it, we’ve had decent recordings for about six decades. In technology years that’s almost Neanderthal. The information on the vinyl doesn’t change. And, we’re still trawling a rock through a trough to retrieve it. It’s the delivery device that evolves. Oracle’s contribution is exemplary. 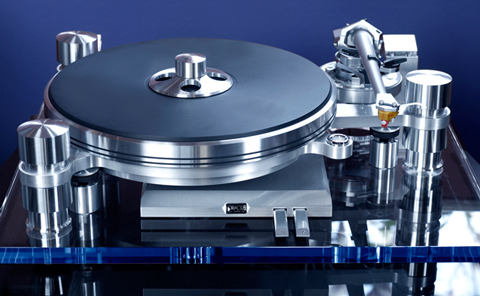 For your personalized SoCal, Oracle turntable listening experience, call Randy at Optimal Enchantment: 310.393.4434. For all Audio/Video set-ups: Jay at Audio Universe: 310.478.8453. Here is a much covered fact from long ago. Back in the 70’s, after a gracious Dr. Sao Win gave a tour of his facilties to one Marcel Riendeau, Mr. Riendeau ‘used’ (to put it nicely) the knowledge he gained from Dr. Win’s turntable to ‘design’ his own. Amazing the similarity of a Win Research table to the Oracle.